Welcome to any new readers that came from Massively to check me out! I’m actually double glad Syp linked to me, as he mentioned the post that he made some years back that was my inspiration for my ability identification post! For some reason I was misremembering it as something I saw on the LotRO forums. I don’t know how many folks might stick around and keep reading, but I’ve been considering a state of the gaming post in any case, so what better time? Here’s what I’ve been up to recently. The 2.5 patch came out Monday, and for the first time I was entirely caught upon the various questlines. I didn’t really have time last night to try running any new group content, but I got everything unlocked and am ready to give some of it a try. The Hildibrand questline continues to be the best thing ever, and I’m especially looking forward to the new Gilgamesh fight. Apart from the new stuff, there’s still plenty of existing goals that I’m still working towards. I’ve leveled all my crafting and gathering classes to 50, but I still have plenty of better gear to work on so I can craft 3 and 4 star items. I’ve been in a bit of a conundrum where I didn’t want to spend a lot of gil melding materia into gear that isn’t best in slot, but working on desynthesis has opened up my ability to craft the best jewelry for gathering and crafting, so that should help me move on up the chain. I’ve also been working on my battle classes and have 3 of those at level 50. Bard remains my main to which I’ve added Dragoon and Warrior. I’ll probably be focusing on White Mage or Scholar/Summoner next so I have a healer job available, but I haven’t decided which yet. 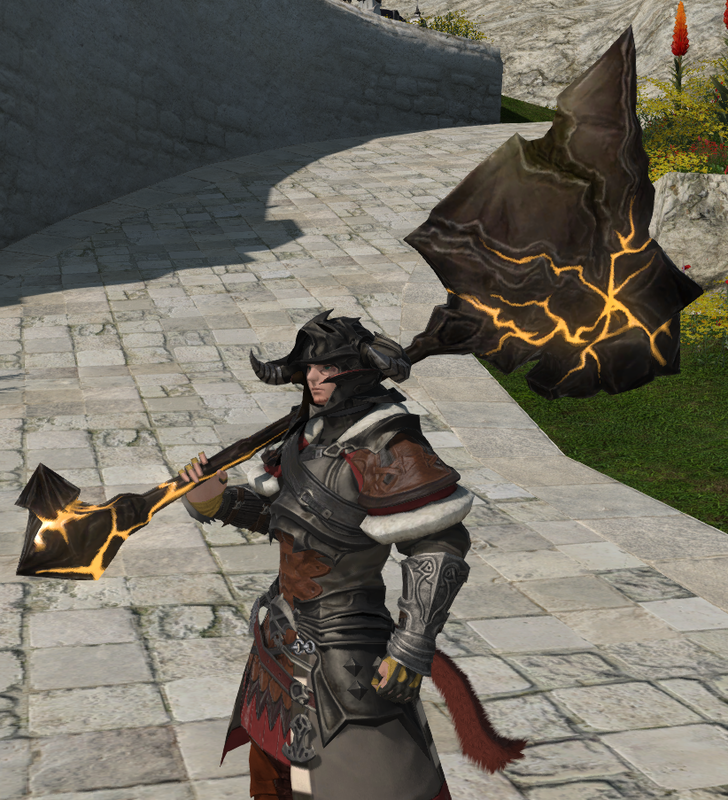 I suspect I’d actually be better tanking as Paladin than Warrior, but I won the most absurd axe in the game off Titan a couple months back, and I’ve been wanting to use it ever since. I’ve honestly not done much in Marvel Heroes recently apart from try to log on once a day to collect daily rewards. I’m sure I’ll swing back around to it again before too long, but for now FFXIV and occasional single player games are dominating my PC gaming time. Among my Christmas presents this year was Shadow of Mordor, which I have been enjoying the hell out of. I absolutely love Arkham City, so the basic gameplay is right up my alley, and the orc captains are a great element. I had one poor idiot come back a total of 4 times, jumping me out of nowhere each time and looking rougher and rougher as it went along. I do have trouble focusing on the story at all since I keep running into captains that need killing and Power Struggles to deal with. I need to at least get to the point where I can brand captains so that getting them promoted actually benefits me. Finally, I picked up the FFX/X-2 remaster recently and have been playing my way through Spira again. I’d forgotten how dark that game is underneath the surface once you know what’s actually going on. So many things that were relatively innocuous the first time through have a whole new level of sad attached to them. Really though, I guess Final Fantasy games have a history of darkness. mass genocide in VI, the whole Cloud/Sephiroth thing in VII, and Tactics, man don’t get me started on Tactics. It’s like a Shakespearean tragedy told with Precious Moments figurines. In any case I just wrapped things up in Luca and am headed out on the Mi’hen Highroad. X is one of the Final Fantasy games that I not only beat but pretty much burned to the ground content-wise the first time around, so it’s interesting seeing what all I remember and deciding how in depth I’m going to go. I have a hard time not collecting all the things, but I don’t know if I’m going to be willing to put forth the effort this time around to, for instance, get Lulu’s final weapon.